MANY interpretations of this week’s photo challenge. After reflecting on some of them, I chose to go with an iconic image, which I took years ago, and wish I had a better, faster camera at the time, to capture the quickly changing expressions, and heart-thumping emotions that I saw. These pictures were taken in the walled medieval town of Monteriggioni, near Siena in Tuscany, Italy. 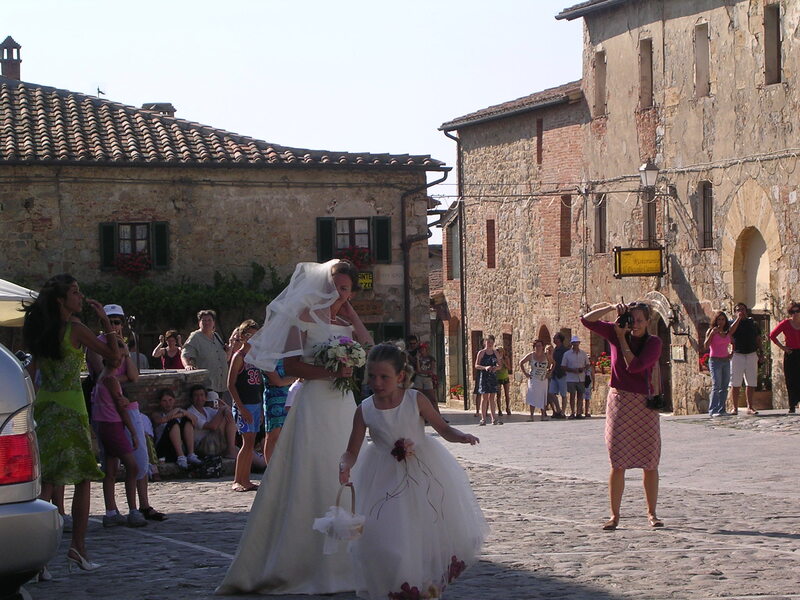 While we were being tourists in this preserved fortress from the 1200’s, a bride pulled up in front of us, grabbed yards of wedding dress in one hand, while she stepped out of the car with the other. I raced over with my camera to see her flower girl, giddy with excitement, trying to be helpful. I captured the bride, as a breeze came along and lifted her veil. Then, the bride and her father walked arm in arm into the church. 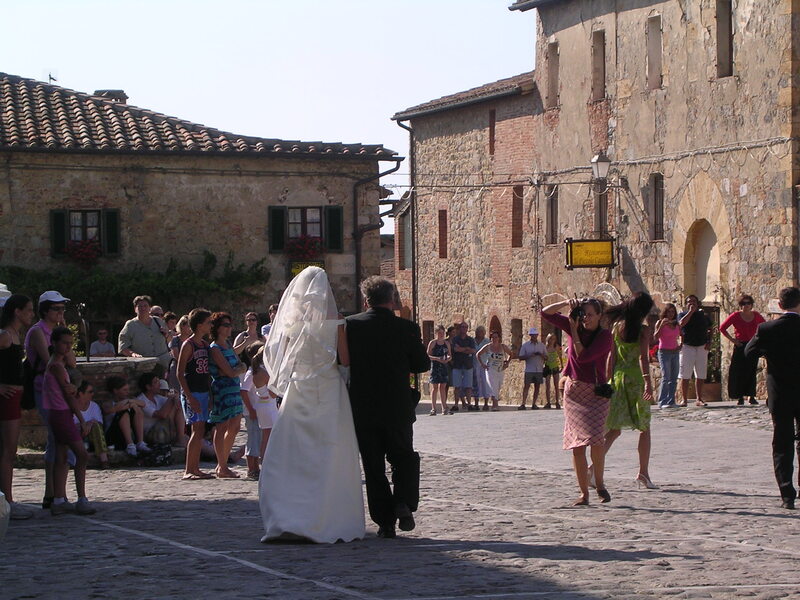 I followed them into the slanted doorway of this medieval church, and watched the Italian nuptials unfold. The challenge is to find interest and depth BEYOND the subject framed in the photo. Although I can’t take credit for Taking the photo, since it is a picture of me, can I say it was my idea/my instructions/my choice of location? 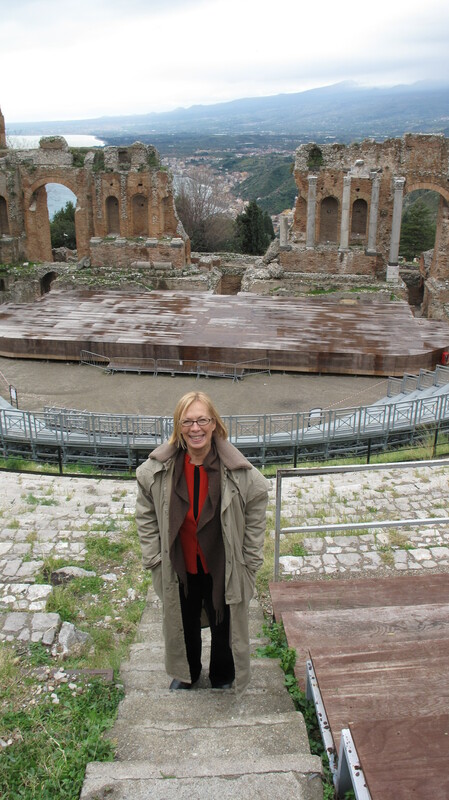 Anyway, it is a fair shot of me, an excellent shot of what is beyond me…the remains of the ancient Greek Theatre in Taormina, Sicily, Italy, and beyond that, the bay lapping at Giardini Naxos near the bottom of the shot and a quiet Mt. Etna in the top right. AND, I just realized that the header on my blog is ALSO taken in Taormina, Sicily, out of my hotel window, of the towers of an old villa, with a snow-covered Mt. Etna BEYOND in the background! 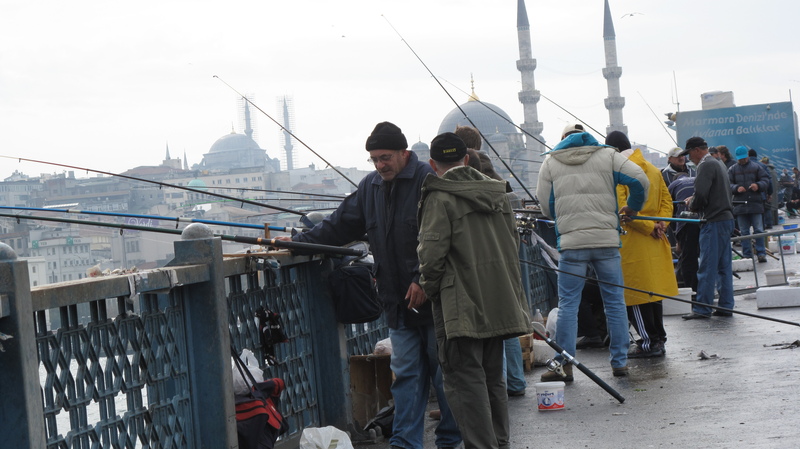 While walking across the Galata Bridge, connecting one part of Istanbul to another, I happened across a group of about 30 men lined up along the bridge, fishing poles dangling in the water, cigarettes dangling from their mouths,and the day’s catch flapping around in buckets. I pulled back to take a picture of these rugged-looking fishermen trying to catch the family meal on a damp, gray November morning. What I didn’t realize, was what I caught BEYOND them, in the background. 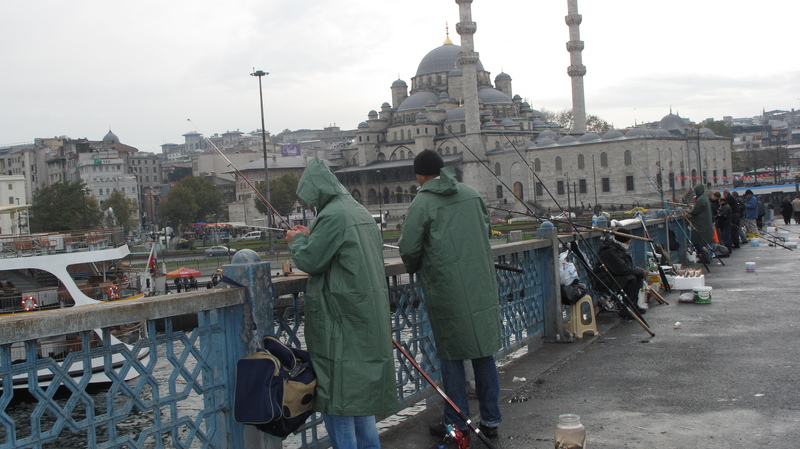 On closer inspection of another photo, I noticed the fishermen framed by both the Suleymaniye Mosque, and the Sultan Ahmed Mosque, commonly referred to as the Blue Mosque. I love the juxtaposition at work here, and all over the city of Istanbul…truly a city of East meets West. I lost my camera on my way back from England last November. It was quite stupid, really. Broke the rule of ‘don’t have too many satellites around you’, so I lost track of one of them and Voila. 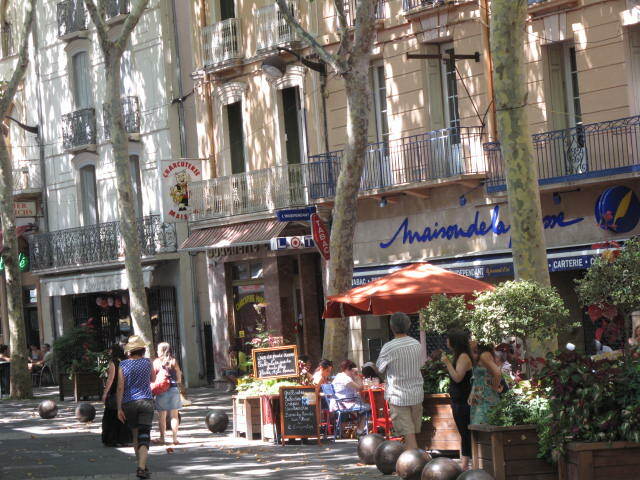 For a time I thought it might show up, so I trawled lost and found sites, called International Airlines, had a local friend make a ‘Don’t mess with me, I’m not a tourist’ phone call, but to no avail. Fantastique! Boarded a plane for New York City this weekend, just as the Weekly Photo Challenge landed in my mailbox. CITY LIGHTS are a true canvas and they were very cooperative this weekend. A sprinkling of rain gave me a great water feature; traffic offered me delightful and moving colors; holiday-decorated trees provided festive in the city; and an (almost) all-night grocery store gave me food for thought. City lights, indoors and out, were always moving, changing, ILLUMINATING the darkest corners, creating light shows at every turn. 2013 – I won’t even Attempt to make a resolution…lose some weight, exercise more… as I have the excuses already lined up and waiting for a cause. Why spend all that time and energy when I know any minute now, someone will invent a pill for that, and then won’t I feel silly?! So, my resolutions, or shall we call them ideas for joyful living (? ), or Rules to live by (no, too strict…no rules), maybe just thoughts and notions?